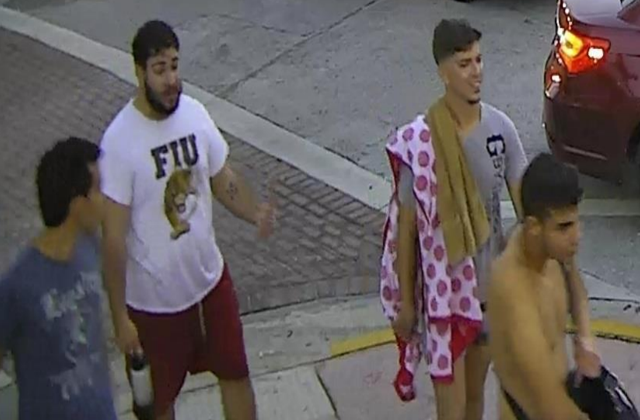 The four men who attacked a gay couple after Miami Beach Pride on April 7 have now been charged with a hate crime. The two victims, Rene Chalarca and Dmitry Logunov were called faggots in Spanish as they were leaving a public restroom and then attacked. Both suffered cuts and bruises and Chalarca suffered an eye injury. The attack was caught on camera and the suspects later surrendered themselves to the Miami Beach Police Department through an attorney. They are Juan C. Lopez, 21; Luis M. Alonso Piovet, 20; Adonis Diaz, 21; and Parblo Reinaldo Romo-Figuero, 21. All four were charged with three counts of aggravated battery. A third person, Helmut Estrada, attempted to assist Chalarca and Logunov and was also attacked during the altercation and injured. Recently Estrada was given an award from the City Commission for his bravery.